This reporter travelled 400 kilometres of highways and roads in the northeastern provinces of Sucumbíos and Orellana and visited six communities affected and 12 sites contaminated by the U.S. oil company Texaco during its oil exploration and production activities between 1964 and 1990. The swamp with the moving trees was the “pool” filled with oil waste from the Yuca 9 well, one of 162 that Texaco claims to have cleaned up or “remediated” between 1995 and 1998. These pools or pits, some of them as big as a football field, were used to dump mud and other waste produced by oil drilling, and even human faeces and garbage, since there were no sanitary landfills or wastewater treatment facilities built. In a sentence handed down by a judge in Nueva Loja, the capital of Sucumbíos, on Feb. 14, the U.S. corporation Chevron, which now owns Texaco, was ordered to pay 9.5 billion dollars as compensation for the damages to the environment and human health caused by its subsidiary. The plaintiffs — indigenous people and farmers organised in the Asamblea de Afectados por Texaco (AAT — Assembly of those Affected by Texaco) — have appealed the verdict, as they consider the amount awarded insufficient to remedy the disaster, including the impacts on human health. 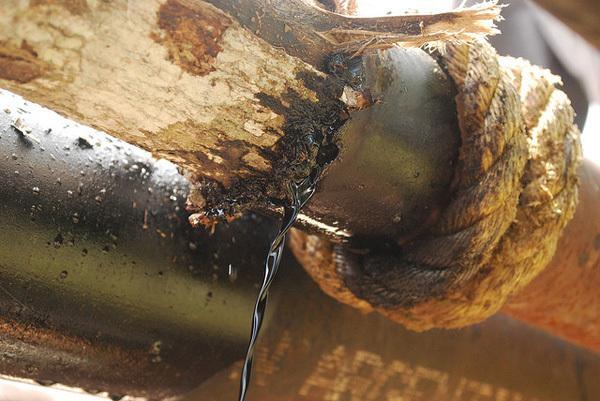 Chevron has also appealed, claiming that the lawsuit is “fraudulent”. The case will now move up to the Provincial Court of Sucumbíos. 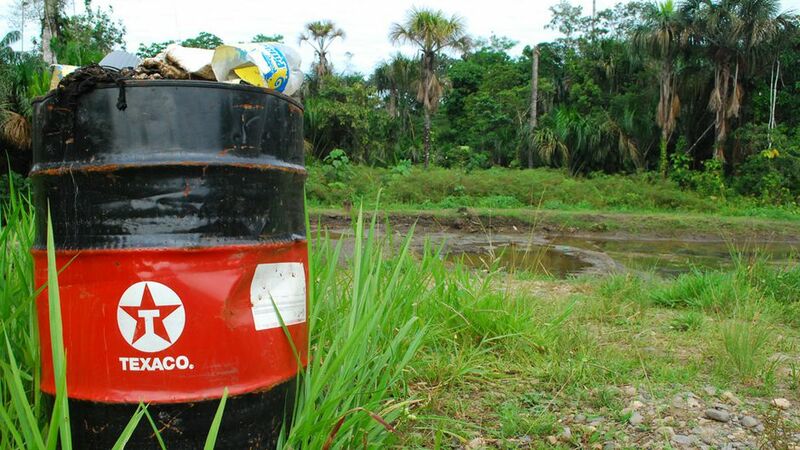 In an agreement signed in 1995 with the Ecuadorian government, Texaco assumed responsibility for remediation of one third of the environmental liabilities resulting from the oil operations in the rainforest. The other two thirds corresponded to the government. At the trial, Chevron alleged that its clean-up obligations had been satisfactorily fulfilled as of 1998. But as Tierramérica was able to observe first hand, the “remediation” of the toxic oil waste pools consisted of filling them with sticks, tires, tanks and scrub and then covering it all up with soil. Over the following 15 years, thanks to the fertile Amazon rainforest climate, these areas have become overgrown with vegetation and even trees — the ones that move with every step you take near them. But you only have to dig down a metre and a half or two to find the oil sludge. Two members of the Amazon Defense Coalition, the group of Amazonian grassroots organisations and communities that is backing the suit filed by the AAT, drilled holes like these for soil testing in numerous sites visited by Tierramérica, including the former waste pit at the Sacha 53 well, where Chevron claims to have reports attesting to successful remediation. Texaco admits to having constructed a total of 326 oil waste pits while operating in the region, but court-ordered inspections and surveys established that at least 956 had been dug. Even before 1995, Texaco had already covered up other pits that the Amazon Defense Coalition calls “hidden pools”. When these pits were dug, they were not lined with any protective material whatsoever, which means toxic wastes seeped into the soil and eventually filtered into rivers and streams. Most of the pits had gooseneck drainpipes installed beneath the surface of the sludge. Supposedly, when the level of liquid waste deposits rose as a result of rainfall, the oil residue would float to the top and clean water would wash through the drainpipes towards nearby waterways. In practice, however, the drainpipes became a channel through which even more toxic wastes were washed into local streams and rivers, and continue to flow through them today. One of the great paradoxes in this tropical rainforest where water is abundantly plentiful is that many villages and communities have no water for drinking, cooking or bathing, because the nearby rivers and streams are totally contaminated. “This is the house of María Aguinda, one of the plaintiffs in the original lawsuit against Texaco in 1993. She joined the suit because this river that flows right past her house was contaminated with oil, and she had to walk two hours to fetch clean water from another river,” explained Rosa Tanguila, a Kichwa indigenous woman from the community of Rumipamba in Orellana. The pollution around here was caused by the Auca 1 well. This is another area supposedly remediated by Texaco, but the toxins produced by oil operations seeped into the river and poisoned it very early on. Pressured by protests and strikes waged by the local inhabitants, the state-owned oil company Petroecuador is carrying out ad hoc — and clearly insufficient — clean-up efforts in a river basin area the size of several football stadiums. Tanguila is part of a team made up by indigenous people from the community hired by Petroecuador to clean up the area. Their work consists of aiming a high-pressure stream of water at the riverbed to remove the sticky black sludge that is then channelled towards a trap, where Tanguila scoops it up with a small hand-held spade and dumps it into a metal tank. “We’re cleaning up what Texaco says it left clean,” Tanguila quipped to Tierramérica. The workers wear rubber overalls while they work submerged in the grey and black mud, but they have neither gloves nor goggles, leaving them exposed to contamination. There were also a number of small children playing on the banks of the same river and getting splashed with the same polluted water. Why not? “Maybe because a lot of Texaco officials went on to join Petroecuador, and they had already planned what they were going to do: make the Ecuadorian government deal with the mess, and let Texaco off the hook,” said Moncayo. Selva Viva, created by the Amazon Defense Coalition, is working to protect an area of the rainforest, rescue endangered species and promote ecotourism: a formidable task in the midst of so much toxic oil waste. This story was originally published by Latin American newspapers that are part of the Tierramérica network. Tierramérica is a specialised news service produced by IPS (Inter Press Service) news agency with the backing of the United Nations Development Programme, United Nations Environment Programme and the World Bank. Gonzalo Ortiz reports regularly for Inter Press Service, an independent news agency covering issues such as development, environment, human rights and civil society. The IPS network includes 370 journalists in 330 locations in over 130 countries worldwide.